Hi my name is Sam Newell, I have worked in the building Industry for over 10 years doing domestic and commercial work as a sole trader. I served a 3-year apprenticeship in Bricklaying and have been working for myself for 6 years now. My main concern is putting customers first, I always ensure all works undertaken are completed to a high standard and make sure I meet my deadlines. I pride myself in being the tradesman you can trust and rely on. 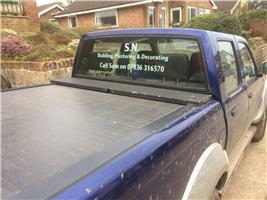 So please call Sam today on 07836 316570 so I can give you a Quote today!